Grocery giant Whole Foods Market announced a recall on specific varieties of its marinade products last August 12. The marinades are said to contain allergens that were not declared on its packaging. The affected marinades are both beer-flavored. It was found that these marinades contained soy and wheat that were not indicated in the packaging of the products. The ingredients are both known as common food allergens and therefore should be indicated as part of the list of ingredients. Both products are packed in plastic bottles and have a net weight of 15 ounces. Both products were also produced in Landover (Maryland). The marinade products were sold from July 3 to August 3 of the current year and were distributed and sold in Maryland, Pennsylvania, New Jersey, Kentucky, Ohio, Washington D.C. and Virginia. Food allergens like soy and wheat trigger allergic reactions in consumers who are sensitive to these foods, in whatever form it may be. In worse cases, allergic attacks can turn into serious medical emergencies. For the recalled products, no allergic reactions or health emergencies related to the said beer marinades have been reported. 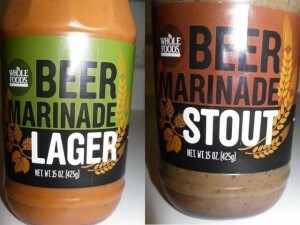 Consumers who still have these recalled beer marinades are advised to dispose of it or return it to Whole Foods to receive a refund. Consumers can also contact Whole Foods at 301-683-0060 from Mondays to Fridays (8:00 AM to 5:00 PM EST).